These are my top ten favorite pictures that were taken in Rome. I have to admit that I did not take them. I have shamefully stolen them from my fellow classmates/travelers. When we first arrived in Rome, road weary from a long journey, we were greeted most humorously by Meg’s beautiful, happy face and our driver. 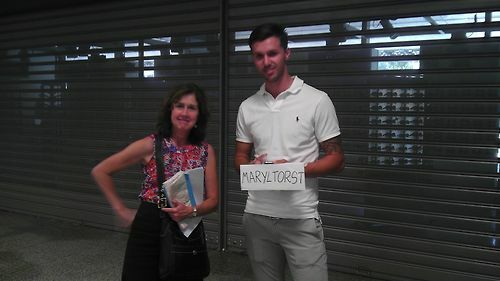 She directed our eyes to the sign he was carrying with a wonderful smile and shared joke. We had to take a picture. I asked if we could keep the sign. I still have it. 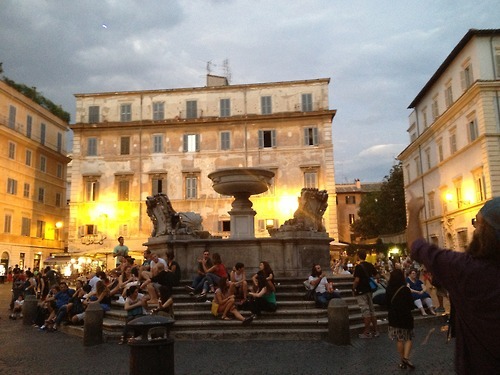 As the Maryltorst group settled into our apartments and our daily schedules, we found that the Piazza di Santa Maria in Trastevere was a great place to meet in the mornings, a wonderful people watching station, a spot where people will beg for money and beg you to buy their trinkets. It was a perfect place for performers to dance with fire and play music because the crowds are always present. This is my favorite picture of all of us. 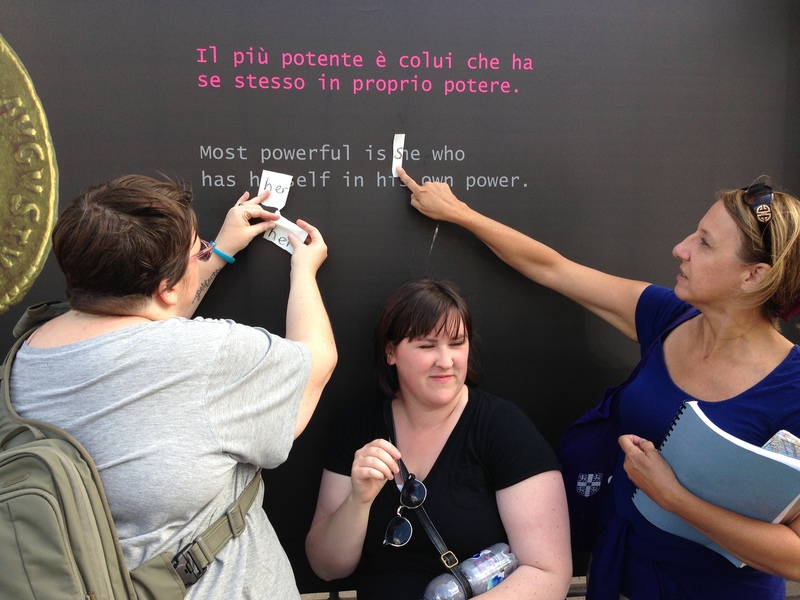 This is in front of the Borghese Museum. One of my favorite museums. It was so nice to have my brother here along with this amazing group of students. We all learned from each other. Taking ownership of the statues and art inside this wonderful museum. One morning we walked out our front door (two wooden doors that open out into a small alley that is the outdoor seating for the restaurant that is across the alleyway from our apartment) and found this sign propped between the two doors. Although we found it very entertaining to think that any noise we make could be louder than the noise that came from the piazza or all the other restaurants in the alleyways, we also felt that we shouldn’t be blamed for something we didn’t do. We felt this was directed at us because it is written in English. Now I think that it is an ironic statement about our apartment living in Rome. Ours was the quietest place in that neighborhood, even when we had a party. 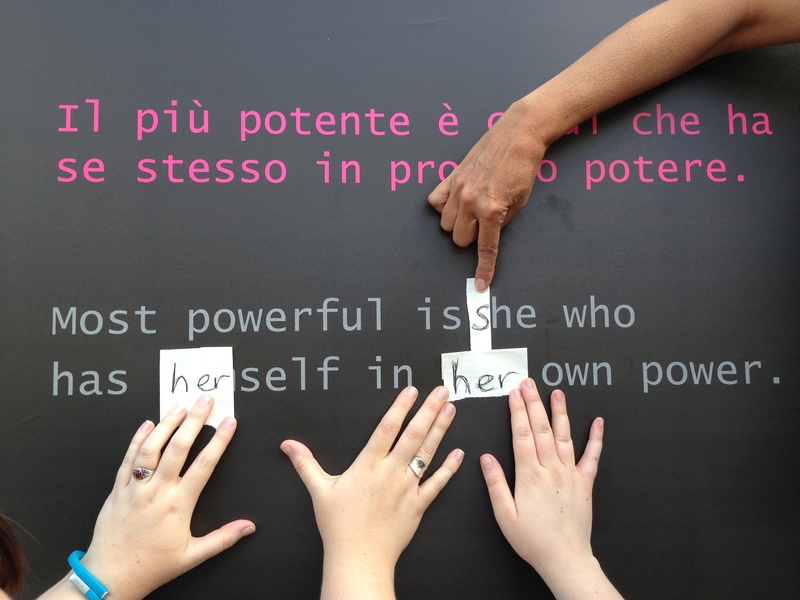 In front of the Museo Nazionale is this sign. This very gender specific sign. We fixed it. 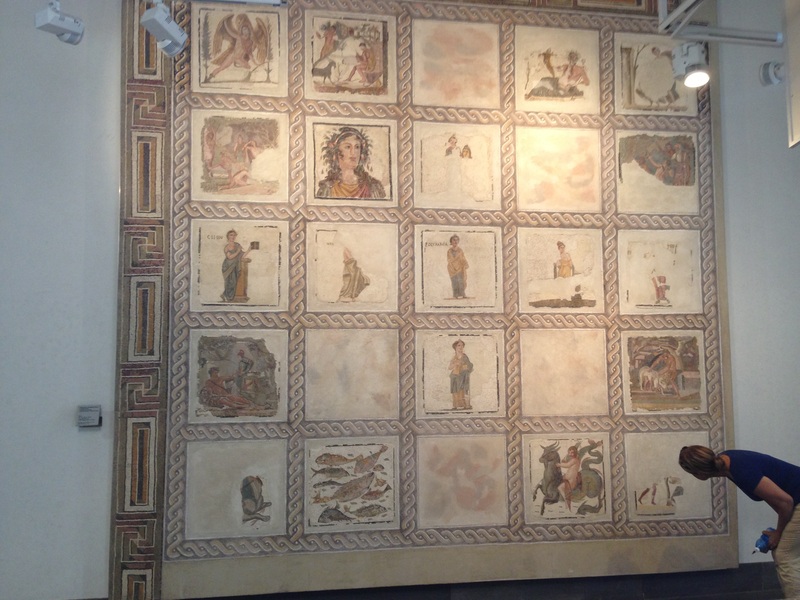 The Museo Nazionale has lots of mosaics upstairs. I didn’t find out about them until the end of our visit so I couldn’t stay gawking at them for very long. This is just one picture that shows the massiveness of some of them. Everything in Rome seems large. I like this picture because it shows a massive mosaic that is created by taking very small tiles to design pictures within the expanse. Something that is that beautiful needs each and every little tile to make it. I look small compared to its size. 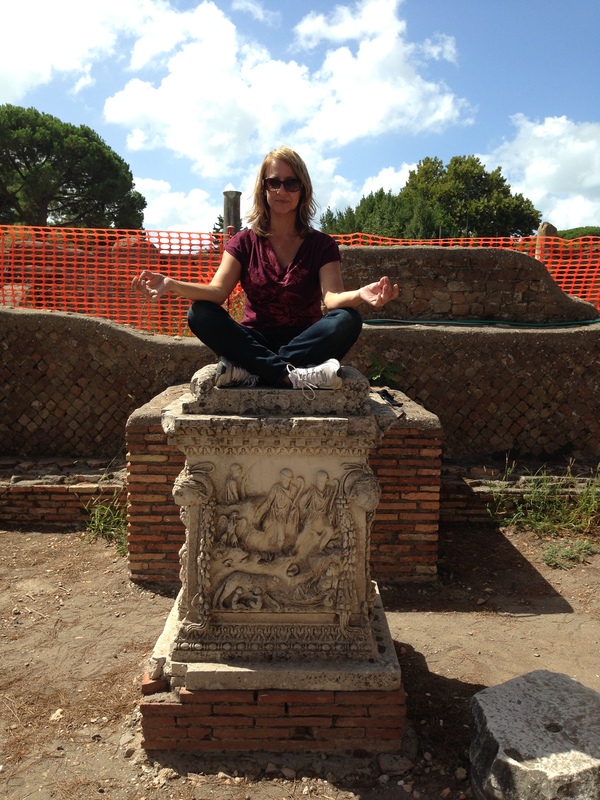 The day after going to the Museo Nazionale, we went to Ostia Antica. I like this next picture because it shows a moment of complete spontaneity. When was the last time I just laid back and looked at the clouds? I thought Ken was losing it when he laid down. Then I tried it for myself and so did Jessica and Nate. I found that clouds are beautiful to look at. Especially the Italian clouds. They were moving in a circular motion. Churning. What a view! I was so enthralled with the clouds that I had no idea someone had taken a picture of us. Here Elizabeth and I are, through the rabbit hole, or the Hole of Antiquity. 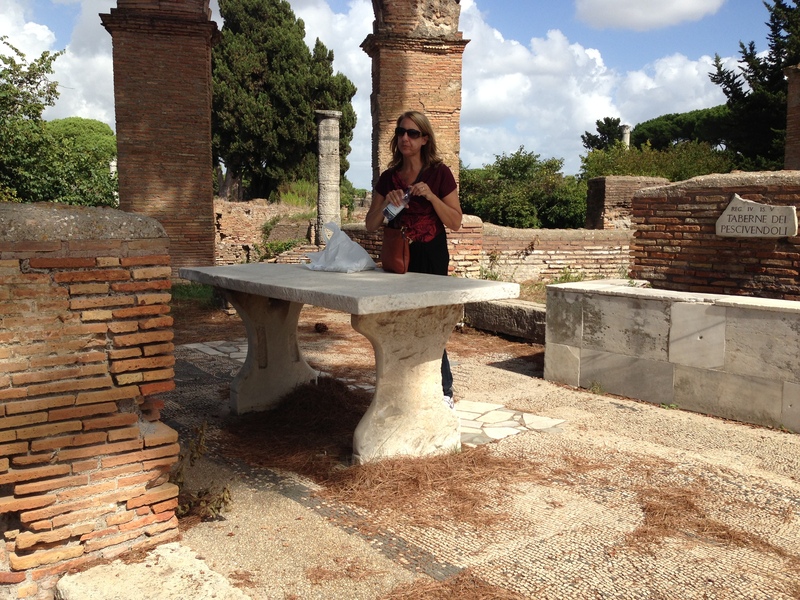 Ostia Antica was a fun place to discover and play. Having my big brother along was fantastic. Here we are eating pizza from everyone’s favorite pizza place. 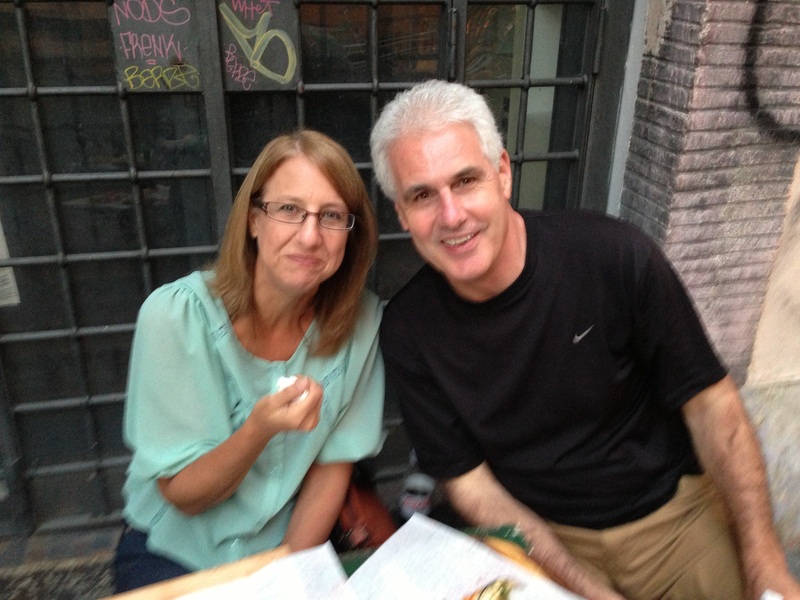 Then, afterwards…Gilatto of course! This last picture is my all time favorite one. Elizabeth took it. The immensity of the columns shows in comparison to me. 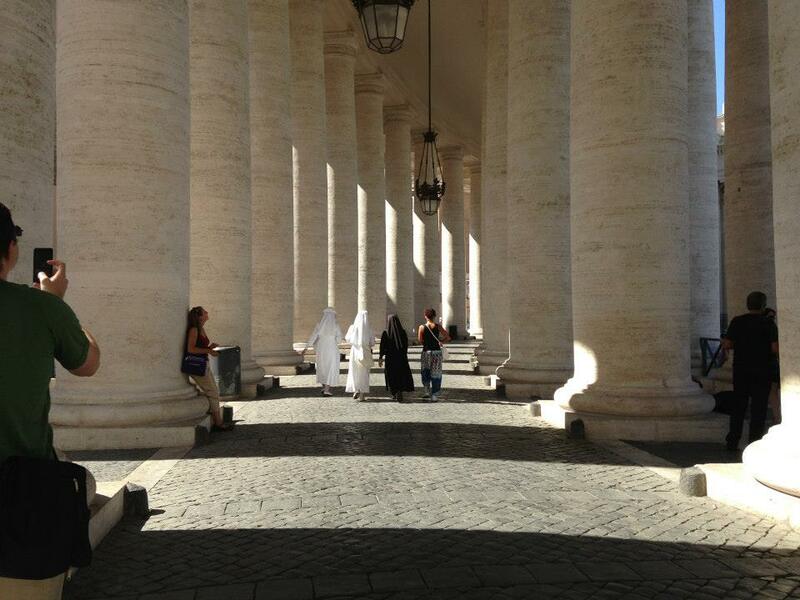 The nuns walking by explains exactly where we are. And to the left of the picture, looking on, is my very good friend Ken also taking a picture. These pictures are in order of when they were taken, not in order of importance to me. Except the last one almost looks like a picture one would see in Life Magazine or something, so I put it at the end. Mass at St. Peter’s Basilica began by standing in a very, very long line. The line was moving pretty good, so we didn’t worry about getting to mass on time. Our attitude was easy going. We’ll get in when we get in. Whatever happens, happens. How can you be rushed or stressed when you are in Rome, standing in St. Peter’s Square on a Sunday? It was all good. When the group of Italians cut in front of us in line, we still had that attitude. We were all getting in the church, eventually. No worries. When they started talking Italian and saying “Americans” we knew they were laughing at the stupid Americans they cut in line in front of. When they brought out food and started sharing it with their group, we knew they couldn’t possibly be going to mass. But, still, we rolled with it. The line was moving quickly, we didn’t worry about getting in. We passed through the security check-point and into the building we went. Once inside there was a blockade. Apparently not all the people in line were going to mass and there was a guard that kept those people away from the small area, within the immense basilica, where mass was being celebrated. First we had to get to him, say, “Mass.” then we were allowed forward. The mass was said in Italian, they sang one song in English, but it was pretty easy to follow since each mass is pretty much the same. The only difference was the homily, but who doesn’t love hearing Italian spoken even if you don’t understand a word? 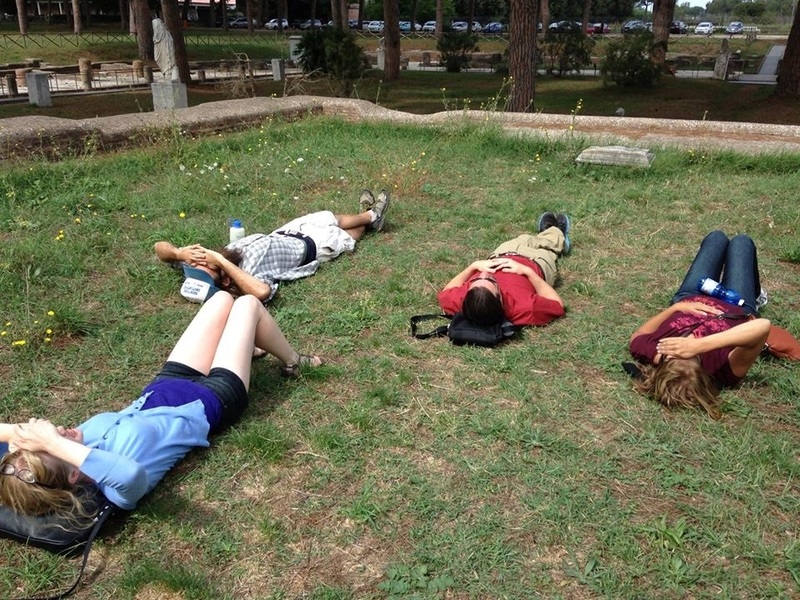 The lovely peaceful feeling we received in St. Peter’s Basilica washed over our group. Little smiles of contentment traveled with each of us as we walked toward the doorway after mass. Then we saw the rain. None of us brought umbrellas. I didn’t have a coat or even a sweater. The crowd was overwhelming. We were body to body. When we lost two members of our group we decided we needed to hold onto each other so nobody else would be swept away. Bodies were pushing us from the back, from the side, toward the square. At one point the crowd stopped and we were caught underneath the drainpipe downspout. Cold water hit us like a waterfall and sucked the breath right out of us, each in turn, as we struggled to move away from it. It was noon and the Pope was in his window speaking, but we couldn’t stop to look up and see him for more than a few seconds. The sky had opened up, the crowd was pushing, and the downspout was soaking us through. We were stuck in a sea of people all trying to leave at the same time. We held onto each other as if the person in front would save us from being pulled into the river and drowned. As the crowd began to lessen I noticed a vender selling umbrellas and bought one in a quick movement of hand in pocket, money in hand, exchange of items, up went the umbrella. When I asked “How much?” he willingly took four Euro instead of the five he was asking for. It was quick and when the others turned around and saw me with an umbrella they were shocked. “Where did you get that?” Trudging home, it took longer than usual to get there because of the rain. Because of the slippery cobblestones. Because we wanted to be inside with those members of our group who hadn’t come to mass that day. Once home, the rest of the day was spent enjoying each other’s company and creating. Writing, posting on our blogs, drawing, chatting, listening to music. Hanging out. What a fun and memorable day! When do you get a day to just hang out with your friends? Inside. The rain was wonderful…once we were inside. The rain was wonderful because it gave us a great story to tell. As we were in St. Peter’s Square being baptized by the Italian precipitation that ran through the downspout, I knew that day would be among one of those moments one always remembers. Although I was uncomfortable, and the peace of mass was pushed away by the throngs of people pushing against us, I was still laughing a bit inside. “These are the moments that make memories!” I called out over the crowd. 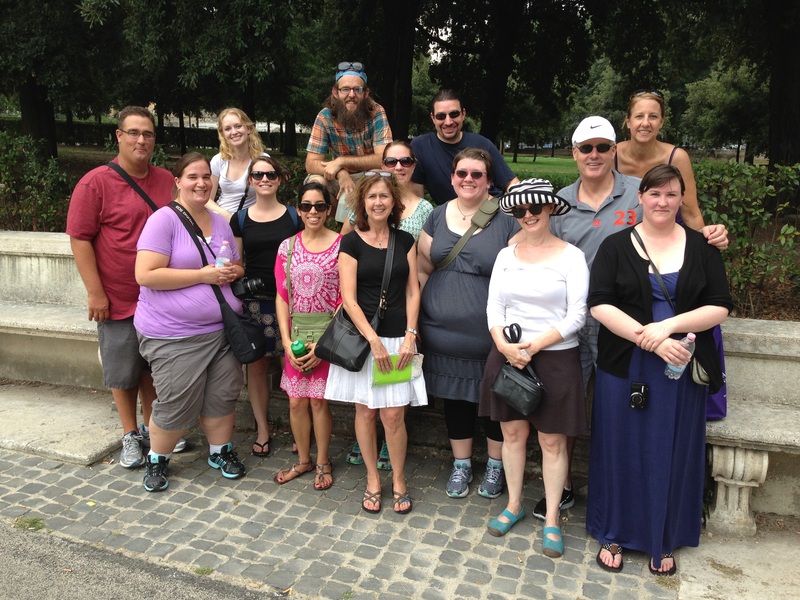 After class on Friday, September 13th, we went to The Vatican Museum, The Sistine Chapel, and St. Peter’s Basilica. As with each museum we visited, we had to present on a piece of art. 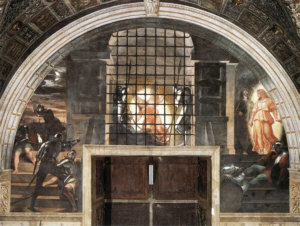 My piece for the Vatican Museum was “The Liberation of St. Peter.” Painted on a wall above a window in the Raphael Room, The Liberation of St. Peter shows Peter in chains and an angel saving him from prison while the guards sleep. Raphael has painted an amazing scene that includes beautiful areas of light and dark. The divine light of the angel glows above all other light even that of the dawn, the moonlight, and the reflections of the torches in the guard’s armor. Along with the light shining in from the window below it, the effect the painting has on the observer is startling. It is so big that it is impossible to capture the entire painting in just one camera shot. Its size, and place on the wall, along with the many people viewing it, adds to the difficulty of appreciating its majesty. The next time I go to the Vatican Museum I would like to just stand and stare at it, to sit in that moment in time when I can exist in a room called the Raphael Room and be in the presence of such spectacular art. This picture from the internet cannot do justice to the painting. The pictures I took were fragmented so I thought I would post this picture so you can see the basic scene. When you go to the Raphael Room in the Vatican Museum you will now know what to look for. Try not to rush through. Try to live in this moment. are right there! Standing in a room that you have heard about many, many, times and knowing that it took Michelangelo a little over four years to paint these scenes on a ceiling, you are overwhelmed by the scale and talent. Then, as the scenes pop out at you, the room swallows you up. The things that bring you back to your body are the sound police shushing the crowd and the crick in your neck. ” How Big Is the Ceiling? It’s about 40 meters (131 feet) long by 13 meters (43 feet) wide. 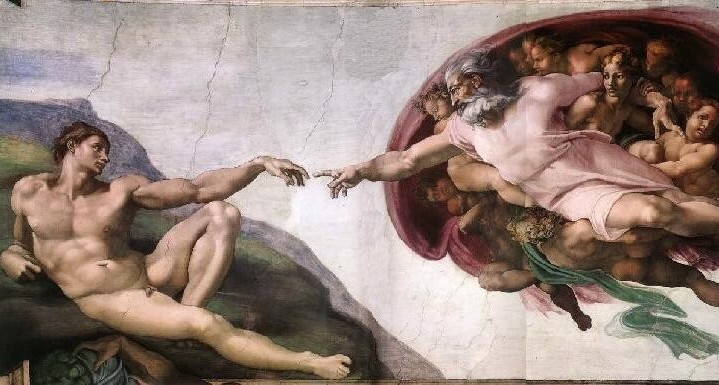 These numbers are rounded off just a tad, but don’t detract from the fact that Michelangelo painted well over 5,000 square feet of frescoes” (Quoted from http://arthistory.about.com/od/famous_paintings/a/sischap_ceiling.htm). St. Peter’s Basilica is large, opulent, full of art, full of marble, beautiful, amazing. I’ll talk more on St. Peter’s in my Sunday, Sept. 15th post. After a full day of art and Catholic history we ate an authentic Italian meal with each other at Meg and Kathleen’s apartment. We were true Italians. All talking at the same time, laughter ringing through the windows, wine flowing like water, bread being consumed with olive oil, cheese…never enough cheese, homemade pasta, tomato sauce, pesto sauce, olives, tomatoes, basil… It was the best meal I had in Rome! We went to Conrad’s on San Francisco/Kelly Ripa street. Actually, the store is called Conad’s and it’s on Via di San Francesco a Ripa. We just decided that we needed to name it something that us American’s could remember. It was funny when my brother, Jake, started calling the road San Francisco/Kelly Ripa street. We knew we had rubbed off on him, making him one of us. I’m pretty sure he still thinks the store is called Conrad’s though. The upstairs is full of clothes and things, downstairs is food. This was our second food purchase. We went to a different store when we first arrived. One that was more Trastevere-like. Small aisles, wandering here and there as if it was a labyrinth of food alleys. Conad had more choices and better prices. That night we went out for pizza and gelato. Each and every fifteen minutes. One Bong for each hour. One clang for each 15 minutes. We knew nothing about the bells of Italy so when we first arrived we wondered why the bells rang. First we realized they rang every 15 minutes. Then we realized there were 2 distinct sounding bells. First the BONG, then the clang. We had conversations about the bells assessing the pattern and frequency. Then, early one morning I looked at the time, then listened for the bells, and realized the sequence. We had plenty of time to figure out the pattern, since it rang every 15 minutes. When we first came we were alerted to the sound through sleepy minds. It’s amazing how fast 15 minutes goes by as you lay in bed not being able to sleep. It’s also amazing how slow they can go by. Those bells counting how many moments in time you aren’t sleeping. Bells counting how many moments in time until you can get up in the morning with puffy eyes. Bells counting down the time that is left to enjoy a beautiful Italian September. Bells we don’t hear any more as we sleep for hours on comfortable beds after a long and busy day in Rome, or Ostia Antica, or Sperlonga, or Viterbo. 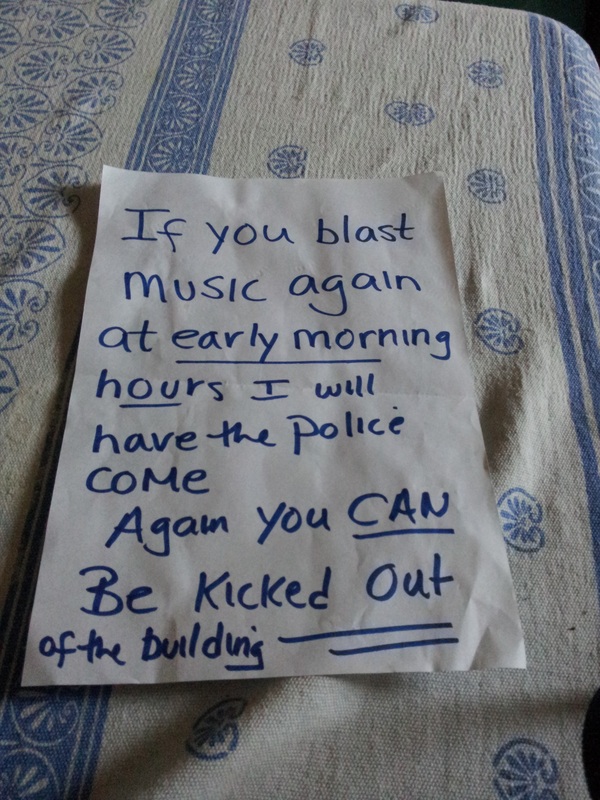 The bells are a part of this culture, this neighborhood, these people. I will miss the bells. 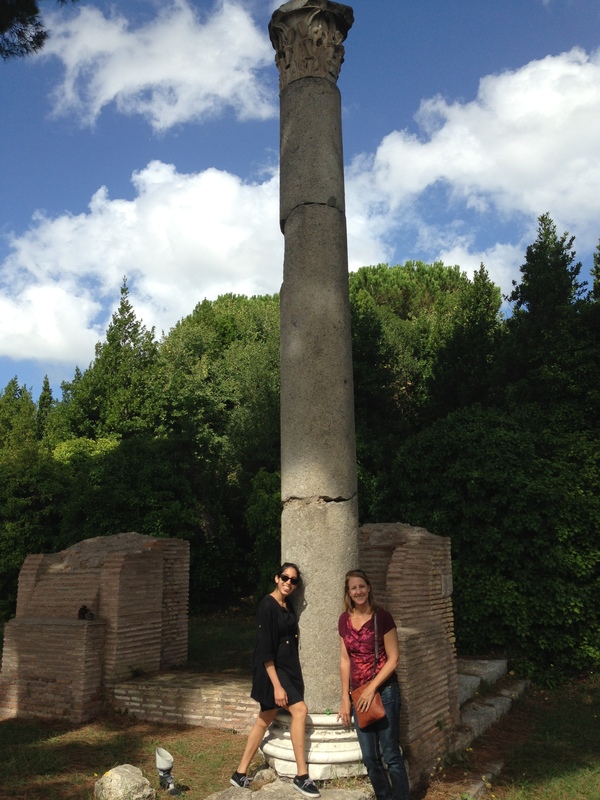 Elizabeth and I next to a column in the ruins of Ostia Antica, a harbor town of Rome. Playing around in the ruins of this rather large town was great fun. 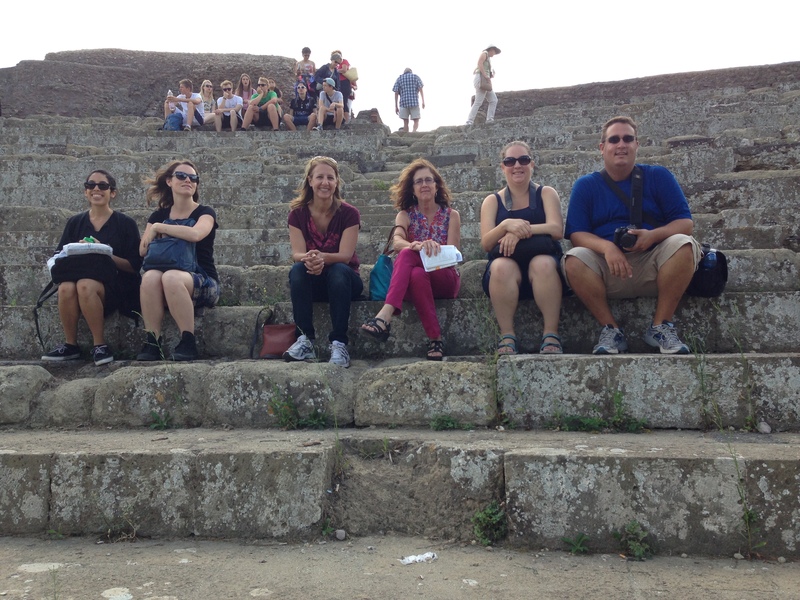 We enjoyed the buildings and imagined what it had been like for the people in antiquity to walk around this town. The mosaic floors are still present, a great surprise to us as we discovered them during our adventurous walk around town. 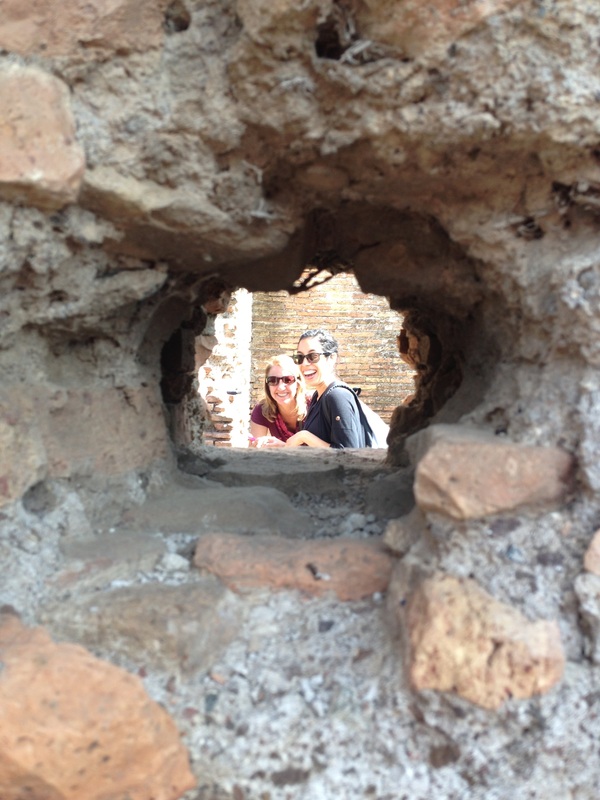 Elizabeth, the best roommate in the world, and I have fun in the ruins while Ken spies on us from the other side of the wall. 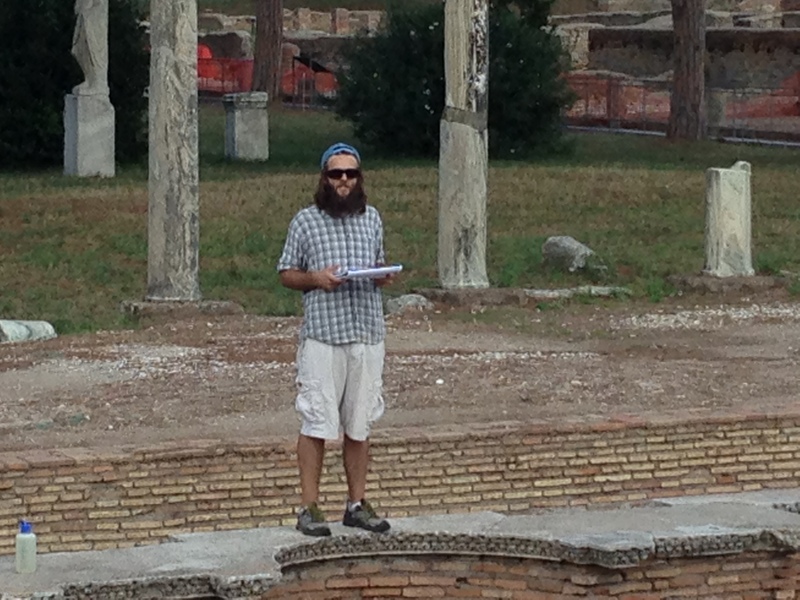 After our adventures within the town, we sit down in the amphitheater and listened to Nate read from Marcus Aurelius. The tour group who was sitting to the right of us was not amused. They asked Nate to stop talking, in a rather ungrateful way. The group of German students also wanted their time on the stage, upsetting the tour guide even more. Nate had fun photobombing the German student group, just because he could. At least they appreciated Nate’s impromptu production, well, so did we. It was fantastic! I will enter a quote from Marcus Aurelius here. I left my homework in my bag, and my bag was taken over to Jessica’s to lighten my load for the afternoon. As soon as I get it back, I will talk a bit about M. A. here. It’s time for a break in my kitchen complete with marble table and marble wall. What it had to have looked like back in the day! 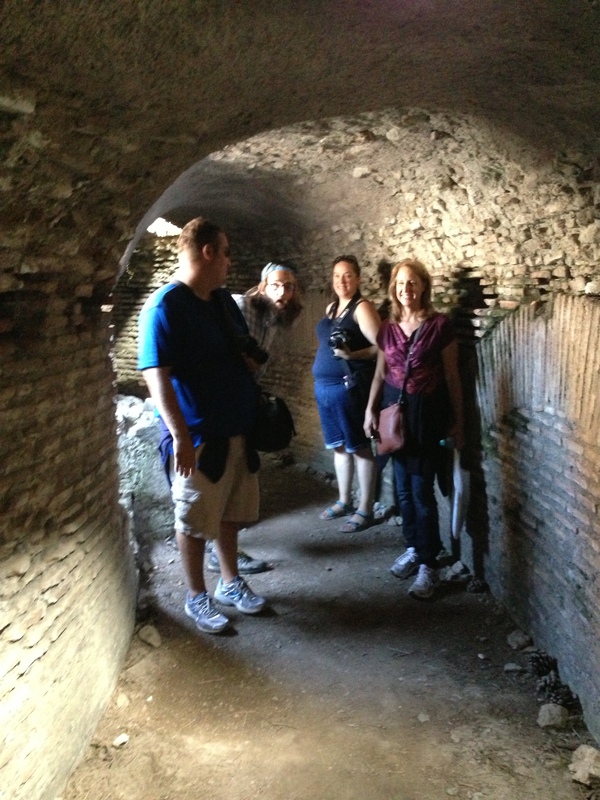 Exploring the drainage and bath house with the Varners, Nate, and Ken. Ken’s behind the camera. 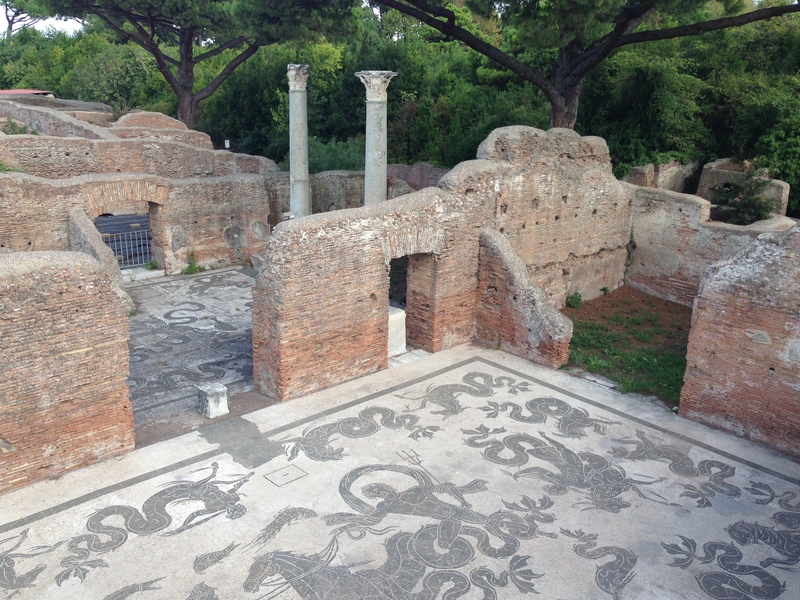 For more on Ostia Antica, visit this website. And thank you to Ken for capturing the women in action! Now on to the museum! Each time we go to one, instead of a tour guide telling us about the pieces we are seeing, we each get a piece of art to report on. We meet outside the museum and present our piece to the group. It is amazing how attached to these pieces we are. You will hear each of us say, “Where’s my piece?” or “Oh! There’s Carrie’s piece!” We own them by the time we are done with each museum. We are now owners of Raphael’s, Michealangelo’s, Carvaggio’s, Canova’s, Corsini’s and much, much more. At the National Museum of Rome I presented on the Discopoulos. Here it is! 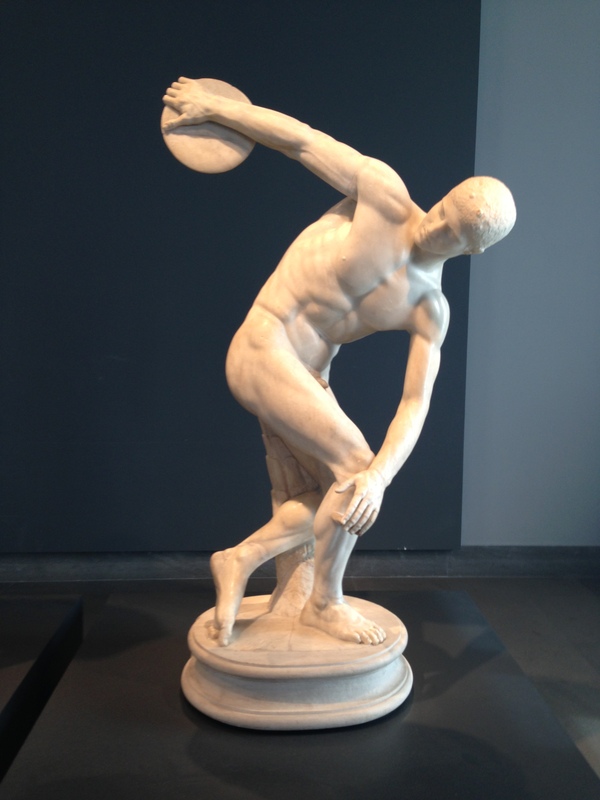 This has been used as a way to study the human body and what the muscles look like as the man is throwing the discus. However, studies have shown (apparently) that his muscles do not show the tenseness of strength that they should if they were ready to throw the discus. Also, this dude doesn’t fool anyway. He doesn’t actually KNOW how to throw the discus. This throw wouldn’t make it go very far. It was fun to learn more about the art in this museum, and feel connected not only the people who are in the group, but to the pieces of art that we are owning; if not in our homes, than in our hearts. They belong to us. We still go around and talk about the art we have studied through the avenue of ownership. I will always remember wandering around this place, slowly and easily. Talking about the pieces as we enjoy each and every one. It was very moving and I felt connected to the art and my fellow students with which I shared them.